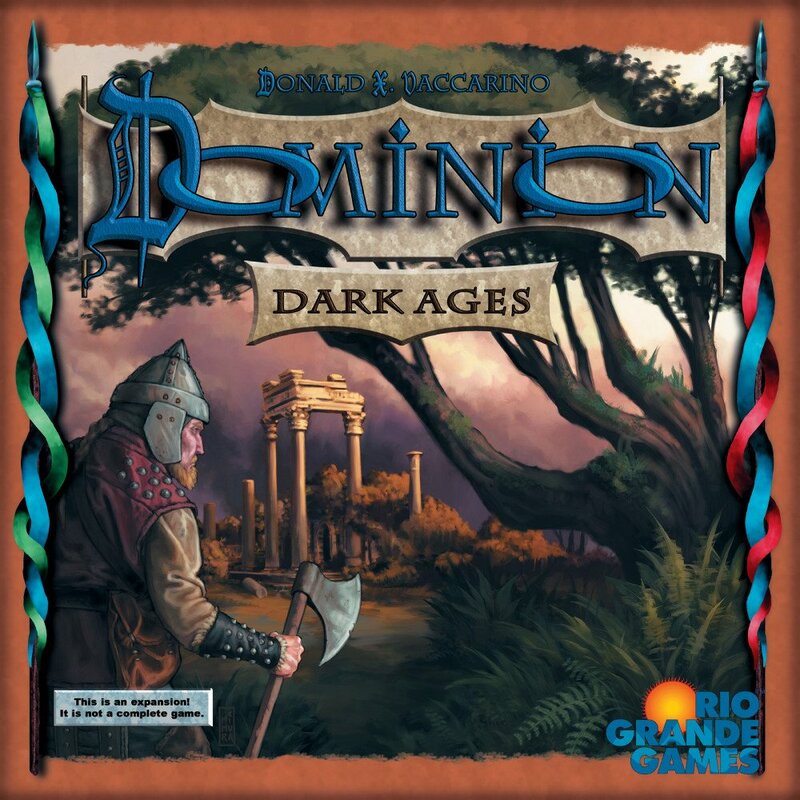 This is the 10th addition to the game of Dominion. It has 300 cards and 96 metal tokens. There are cards you can buy now and pay for later, piles with two different cards, and Landmarks which add new ways to score. VP tokens and Events return from previous sets. We hope you enjoy this expanding world of Dominion! 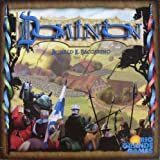 Dominion: Empires cannot be played by itself; to play with it, you need Dominion or the first edition of Intrigue, as both provide the Basic cards as well as the full rules for setup and game play. You can also use the Base Cards set, which provides the Basic cards you need to play, but it does not provide the full rules for setup and game play. 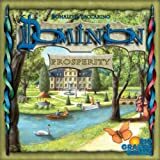 Dominion: Empires can also be combined with any other Dominion expansions you have. Empires has 24 randomizer cards, 21 Landmarks, and 13 Events. Players will need the Treasure cards, Victory cards, Curse cards, and Trash card from either Dominion or Base Cards. As with previous Dominion games, players must choose 10 sets of Kingdom cards for each game. If players choose the random approach for choosing sets, they should shuffle the randomizer cards from this expansion with those of any other Dominion games they choose to play with. Players may choose to shuffle the Event cards and Landmark cards into the randomizer deck (despite having a different back). They are not part of the 10 Kingdom cards used in a game; when players turn over an Event or Landmark, they put it on the table but keep turning over cards until they get 10 Kingdom cards. For normal play we recommend using at most two Events and/or Landmarks per game; skip any further ones. Also skip Events and Landmarks when using a randomizer card to determine whether or not to use Platinum/Colony (from Prosperity), or Shelters (from Dark Ages) in a game. Events and Landmarks cannot be Young Witch's bane (from Cornucopia). Another approach some people may prefer is to shuffle Events and Landmarks separately into their own randomizer deck, and always play with one or two of them. Empires has Debt tokens. These are indicated with the symbol, usually with a number on it, e.g. . Having Debt tokens prevents a player from buying cards or Events; Debt tokens do nothing else (for example they have no effect at the end of the game). Buying a card or Event with in its cost gives the player that many Debt tokens. A player removes Debt tokens in the player's Buy phase by paying per Debt token to remove it; this is done after playing Treasures, but can be done both before and after buying cards. Removing Debt does not use up a Buy. amounts are something different from coin. An amount of coin and debt is only larger than another if both the coin and debt amounts are larger, or one is larger and one the same. Amounts that do not specify coin have , and amounts that do not specify have (including all previous Dominion card costs). Math involving coin amounts does not affect debt amounts. Players cannot just take Debt tokens for no reason. Players cannot overpay with Debt (for Dominion: Guilds cards). Debt tokens are not counter-limited; players should use a replacement if they run out. Possession (from Dominion: Alchemy) now has errata that causes it to give the Possessing player all tokens (and cards) the Possessed player would get, which includes tokens and tokens. Five Kingdom Card piles in Empires have two cards in them, with 5 copies of each - Catapult / Rocks, Encampment / Plunder, Gladiator / Fortune, Patrician / Emporium, and Settlers / Bustling Village. The Randomizers for those piles show both cards. During set-up, always put the cheaper card on top, e.g. Patrician (cost ) above Emporium (cost ). To mark the pile, turn the bottom half sideways. That way players remember that the other card is there. Turn it back when those cards are uncovered. Players may only Buy or Gain the top card of a pile; players have to work through the top 5 cards to get to the bottom 5. Players can read the covered card to remember what it does, but cannot buy it or gain it until it is uncovered. If the card is covered back up somehow - for example Encampment can return to its pile - then once again players cannot Buy or Gain the covered cards, until again uncovered. Returning cards to a pile, such as with Ambassador (from Dominion: Seaside), can also result in the pile being in an unusual order; an Ambassador could return a Plunder to the Encampment/Plunder pile on top of an Encampment. Some cards refer to the cost or types of a pile as if it is just one card. In these cases go with what is on the Randomizer card, which usually matches the top card. Some things refer to cards from a particular pile; these things work on both cards from a split pile. For example Training (from Dominion: Adventures) lets a player put a token on an Action pile, which causes them to get + when playing a card from that pile. The token can be put on the Catapult / Rocks pile, despite Rocks being a Treasure; and the token causes both Catapult and Rocks to produce an extra when played. Emptying the top half of a split pile does not count as emptying a pile, for the game end condition or cards that refer to empty piles. The entire pile needs to be gone for the pile to be empty. One Kingdom Card pile in Empires has 8 different cards - the Castles. They behave similarly to the other split piles; only the top card can be bought or gained, they go in order by cost with Humble Castle on top, and so on. This pile is treated as a Victory - Castle pile, as per the Randomizer, despite the top card being a Treasure - Victory - Castle. In 2-player games, use one of each Castle; with more players, use all 12 cards. Landmarks provide new ways for players to score. Like Events, they are not Kingdom Cards. Players may choose how to determine what Landmarks to play with. They may shuffle them with Events and deal out 2 cards from that pile every game; they may shuffle them into the Randomizer deck and use 0-2 depending on how many come up before finding 10 Kingdom Cards; or they may use any method they like. Whatever method is used, Landmarks in use are visible to all from the start of the game. We recommend using no more than two per game. Many Landmarks only apply when scoring at the end of the game. In addition to counting up their regular points, players add some bonus based on the Landmark. A few are penalties instead - players subtract points from their score. Some Landmarks start with 6 tokens on them per player in the game. So, 12 in a 2-player game, up to 36 in a 6-player game. These Landmarks then provide a way for players to get the tokens from the Landmark. When the tokens on the Landmark run out, players cannot earn further points in that way. In play - Action cards and Treasure cards, once played, stay face-up in a play area until they are moved somewhere else - usually until they are discarded during a Clean-up phase. Set aside cards, trashed cards, cards in the Supply, and cards in hands, decks, and discard piles are not in play. Some cards have a dividing line on them. This separates things that happen at different times. When a card is played, it only does the effects listed above the line; text below the line happens at another time, indicated on each such card. Empires includes Treasure cards with rules on them. They are just like normal Treasures, but have special abilities. Players play them during the Buy phase like normal Treasures, and they are affected by cards that refer to Treasures. Players may play their Treasure cards in any order, and may choose not to play some (or all) of the Treasure cards they have in hand. During the Buy phase, Treasures cannot be played after any cards or Events are bought. When two things happen to a player at the same time, that player picks the order to do them, even if some are mandatory and some are not. For example, if Defiled Shrine is being used and Sylvia gains a Temple, she resolves both effects, but can choose whether to resolve Defiled Shrine first or Temple first. When two things happen to different players at the same time, go in turn order, starting with the player whose turn it is. For example, when a player plays Catapult and trashes Silver, the other players gain Curses in turn order, which may matter if the Curses run out.